The Philippians 4 Challenge is as simple as it is audacious. In the first century, the Apostle Paul commanded the early church to live out four habits to attain three incredible promises: the peace of God that will guard you, the presence of God that will surround you, and the contentment of God that will free you. The Philippians 4 Challenge is simply taking God at His Word, living out what Philippians 4 commands us to do, and seeing if God’s promises are really true. Fill out the survey below to get a baseline on where you are now, read the devotionals for 21 days and follow through with the action steps, then see how much progress you’ve made after 21 days. Answer each question below on a scale of 1 (doesn’t apply to you) to 7 (perfectly describes you). Get ready for a life-changing journey! 1 I'm like a kite flying in a hurricane. Anything negative sets me off inside. 4 Sometimes I'm shaken up, sometimes I'm not. 7 Nothing affects me. I'm as solid as a rock. 1 Not very close. I don't really sense him at all. 4 I occasionally feel close to Christ, but not as often as I'd like. 7 I sense a closeness to Christ on a regular basis. 1 I constantly struggle with jealousy and focus on all that I do not have. 4 I play the victim card occasionally, but not too often. 7 I do not struggle with jealousy. I am perfectly content. 1 My mind is a raging storm. People have no idea the chaos that dominates my mind. 4 I have good days and bad days. 7 My mind is calm and tranquil, unaffected by the circumstances of life. 1 Hardly ever. Most of the time I can't sense him at all. 4 Occasionally I sense Christ's presence. 7 I have regular fellowship with Christ. I sense his closeness regularly. 1 Not very content. In fact, I'm miserable. 4 I'm content sometimes, but not as often as I'd like to be. 7 I'm perfectly content with my life. I couldn't ask for anything else. What's the greatest thing you hope to accomplish through the Philippians 4 Challenge? 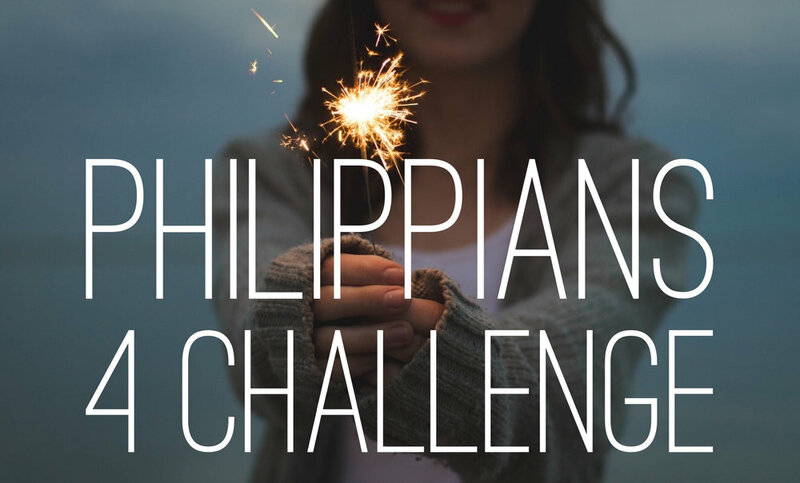 Thank you for taking the Philippians 4 Challenge! Each day’s devotion will be emailed you to at the address you provided. You can always access and share daily devotions from the links on the right. Thank you again! Finished with the Philippians 4 Challenge? CLICK HERE to take your final survey and share your story of how you’ve grown over the past three weeks.